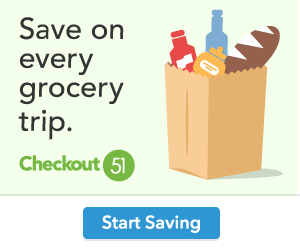 Checkout51 – Earn cash back on groceries at Costco and Amazon! What is Checkout51? It’s basically a cash back savings app, you simply browse your offers – shop in store or online and then submit your receipts showing that you’ve purchased the items listed in your Checkout51 offers. You’ll start earning cash back rebates in your Checkout51 account which you can then redeem for cash once your account has reached $20. It’s that simple! It’s completely free to sign up and new offers are released each week on Thursday. No smartphone needed! You can view your offers and submit receipts via any PC. Checkout51 can be used online – wait what? Yes that’s right EVEN on AMAZON! Checkout51 can be used at warehouse stores, once again YES even at COSTCO! You can stack paper coupons with Checkout51 and you can double or triple up on your savings with other savings apps such as Ibotta. Get something FREE each week. Checkout51 offers a weekly “choose your own discount” where they offer $0.25-$0.50 off a purchase that could easily mean something small for FREE.